In SOS Kindergartens, children are regularly given the opportunity for guided 'make believe' play to help them prepare themselves for situations which they will find themselves in during everyday life. During these sessions, children are encouraged to act out everyday situations that they may find threatening or worrisome; for example, visiting the doctor or the dentist. Through make believe play, the children can work through any worries or fears that they may have surrounding the situation. It is also an opportunity for the children to begin to realise that not everyone thinks or behaves like them and to consider the feelings of others. When the children are behaving 'like a doctor', teachers will often be able to observe the child acting far more maturely than they do normally. The child is also able to project their own feelings onto dolls or other 'props' that they are playing with. Some children know from an early age what they want to be when they grow up, but for others it takes a while for them to have any idea. Make believe play gives the children the chance to 'try out' different roles in society and to become familiar with different options that are open to them. 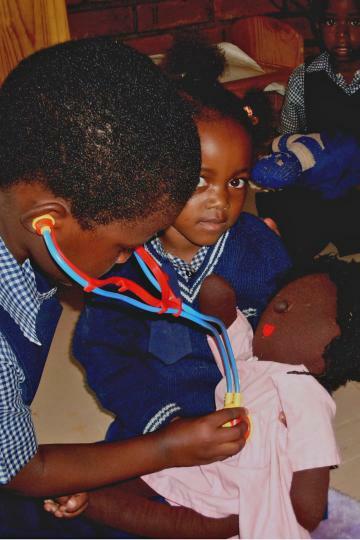 At SOS Kindergarten Lilongwe, favourite 'make believe' play centres around pretending to be doctors and nurses, fire fighters, train drivers, teachers, shop keepers, mummies and daddies and a variety of other roles.